The Bay of Noon is set in Naples a decade or so after the end of the Second World War. The voice that leads us through the novel belongs to Jenny, a young woman who has been sent to work on the new NATO base at Posillipo outside the Italian city. Jenny is unattached and rootless, having spent her younger years between Africa and England meeting the needs of family. In Naples she is freed from all three for a year. The Bay of Noon tells the story of that year through Jenny’s emotional response to the city and those she lives amongst. The latest paperback edition of the novel is a slim 180 pages, and is filled with writing that is so light and perfectly stitched that the threads are barely visible. Reading each page is like looking down from above at a fish in a pool – the detail dappled and quick but the impression completely understood. 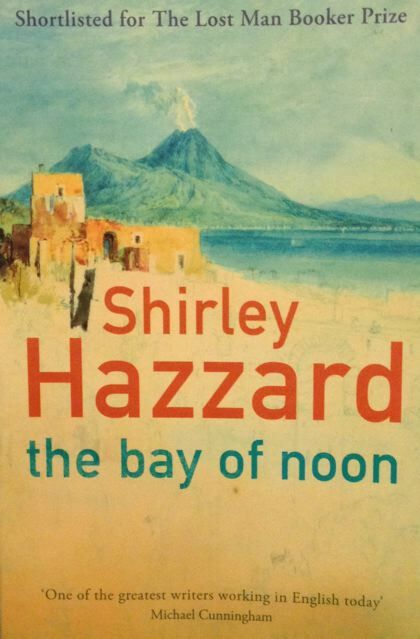 The author, Shirley Hazzard, was born in Australia between the First and Second World Wars. In 1951 she moved to New York with her parents and spent that decade working for the United Nations. It was not a happy time for her although it had its highlight – her year in Italy which resulted in The Bay of Noon, her second novel. Jenny, the protagonist, is caught, just like the author was, between the male bureaucracy of NATO and the exuberant extravagance of Naples. It is Jenny’s exploring that guides the reader through the city and around lives cast off from war. The tone makes the book feel supple, simple, an easy read – but it takes you far deeper than you realise. This latest edition of The Bay of Noon was published by Virago Press in 2010, the year that the novel was shortlisted for The Lost Man Booker Prize. This prize was a one-off award for novels that, thirty years previously, in 1970, had lost out when the decision was taken to no longer award the Man Booker Prize retrospectively. Other novels by Hazzard include The Transit of Venus, winner of the 1981 National Book Critics’ Award; and The Great Fire which won the National Book Award for fiction in 2003, and the Miles Franklin award in 2004. The Great Fire was also shortlisted for The Orange Prize 2004 and the Man Booker Prize 2004. This entry was posted in Books, Books on Italy, Italy, Novels, Reviews and tagged Naples, NATO, Shirley Hazzard, The Bay of Noon, The Lost Man Booker Prize, Virago. Bookmark the permalink. Naples could well be an inspiration to other writers too…..watch this space!